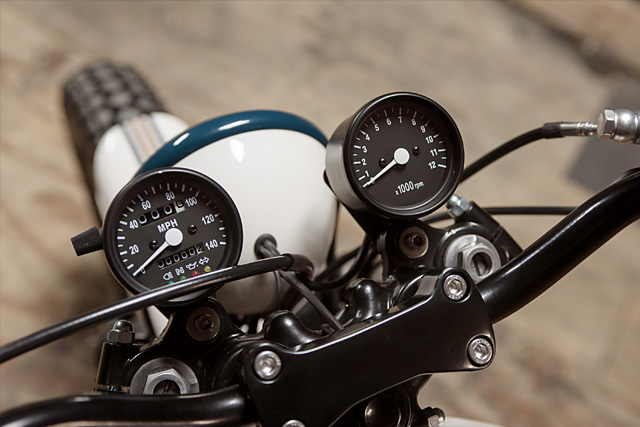 Analog Motorcycles is located in Gurnee, Illinois and under the guidance of founder Tony Prust they’ve produced some incredibly clean bikes. 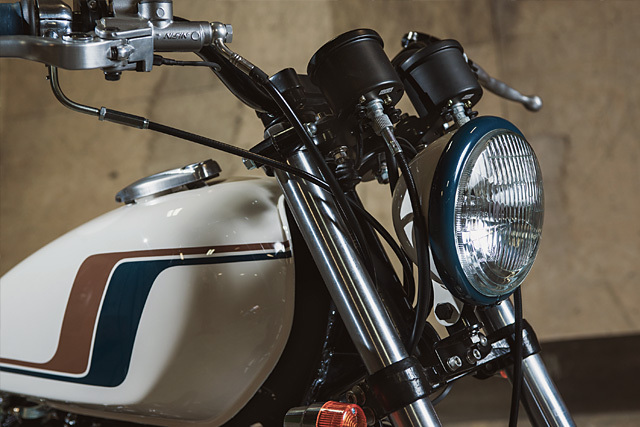 Increasingly often they’ve turned their hand to some relative oddballs on the custom scene – with a 1958 BMW R50, 1949 Indian Scout and a 1975 Ducati GT860 rolling out of their shop in the last year alone. 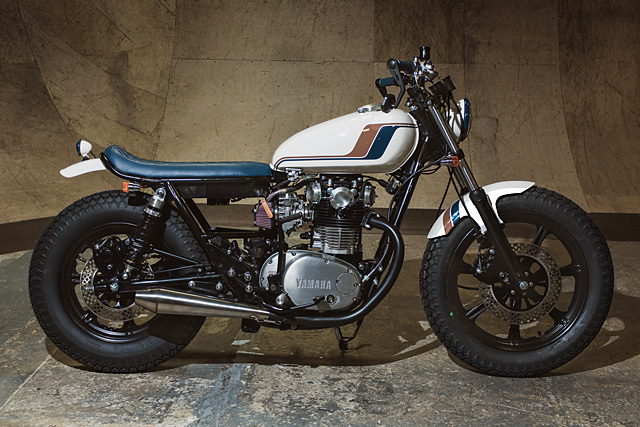 This time around they’ve gone back to a staple of the custom scene – a 1979 Yamaha XS650. And given the exceptional attention to detail and the quality of the work that has gone into the bike I think we’re all the better for it. 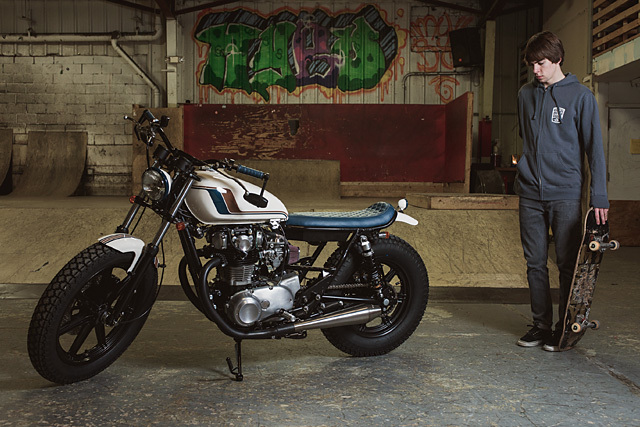 Made in various guises from 1968 to 1985 the XS650 has a dedicated following across the world. It handles well (especially the later models) it’s reliable and has a strong engine that responds well to tuning. 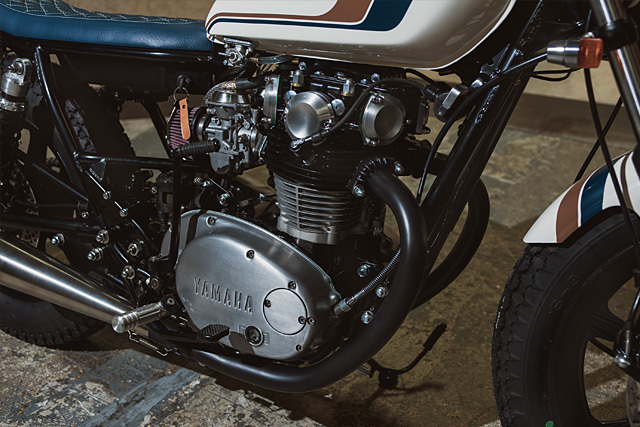 But my favourite thing about the XS is the ubiquity of its components – in typical Yamaha fashion many parts on the bike remained unchanged throughout its production run and often shared parts with other models across the marquee’s line up. This particular XS was purchased by Analog as a started-but-not-completed build from one of the friends of the workshop. It sat around for a while until a customer, who initially wanted to modify a Suzuki Gladius (shhh, I know), thought it was a better to start from scratch with the XS. 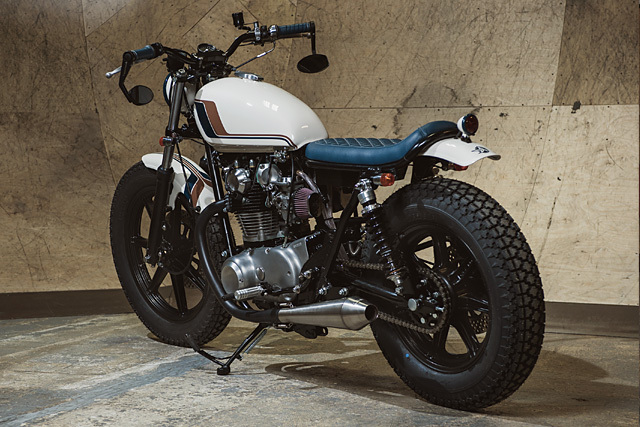 A backlog in the shop meant that when it finally came time for the bike to be put together the customer was already getting around on a customized Triumph and the Yamaha was destined for his wife instead. Lucky lady. 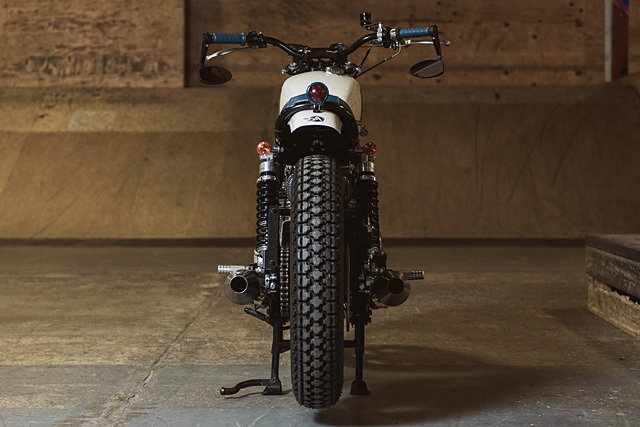 This yielded its own set of challenges – to make her comfortable on the bike it would have to be lowered. The front end was dropped around one and a half inches and the rear was brought back into line by RaceTech shocks built to her weight and riding style, with low tracker bars and a lower profile seat making sure everything was within her reach. The engine was carefully rebuilt to stock specifications but sported K&N air filters and custom-built ceramic coated headers running into Cone Engineering mufflers. The bike was completely rewired and now runs a Pamco ignition and charging system. Controlling it all is a digital Motogadget M-unit and controls – an increasingly common bit of kit that, while pricey, is winning a lot of people over with its simplicity and ruggedness. 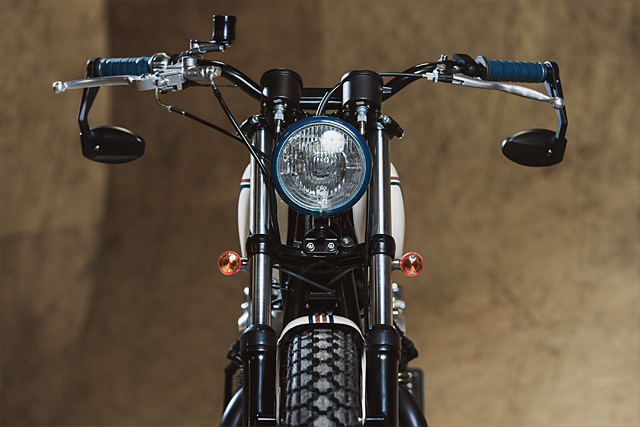 There’s some tidy fabrication work here too – with the battery box being custom-made, a neat ignition unit tucked to the side and bobbed fenders that have the perfect amount of clearance. The rear of the standard tank was also modified to make it sit level given its new, lowered stance. Despite all these fantastic little touches I think it’s the way the lines of the Agnessa flow and its cohesiveness that makes it work so well. 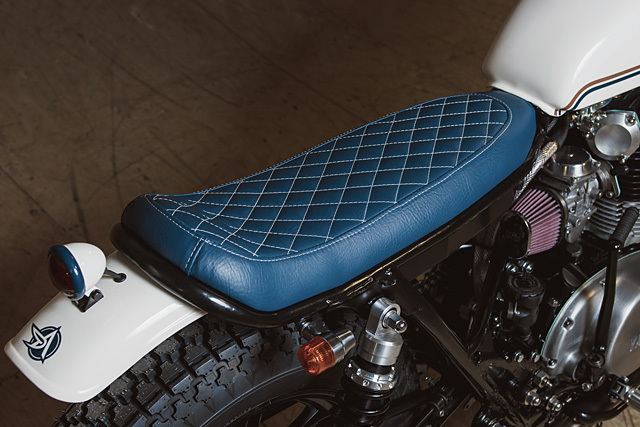 The colour scheme is striking, but not overbearing and it’s completed with just the right level of restraint – the touches of blue on the headlight and stoplight surround are perfectly matched to the upholstery, grips and the lines through the tank and guards. Similarly, it isn’t too black either – they’ve held back on ceramic coating the mufflers and the engine barrel and sidecovers. Best of all? It’s got mirrors and fenders and is looks to be road-ready. I’m really looking forward to seeing what Analog produce next.